What are your marks in GATE 2019? I scored 87.72 marks, and my GATE score is 1000. Walk us through that very special moment when you got to know that you are AIR-1 in GATE 2019? Actually I was studying for my ESE Mains test series. It was around 4.45 PM, when I came to know that GATE result has been announced. I opened my laptop, and checked the result. I first informed my father and mother, and then my two brothers. They were very much happy, and I too was very ecstatic. My father is Superintendent Engineer in MPWRD, and my mother is a high school principal, and my brothers are currently working in Bangalore and Hyderabad. Tell us about your schooling. I did my schooling in Bhopal only from Campion School, and then I completed my B.Tech Civil Engineering from IIT Bombay in 2016. 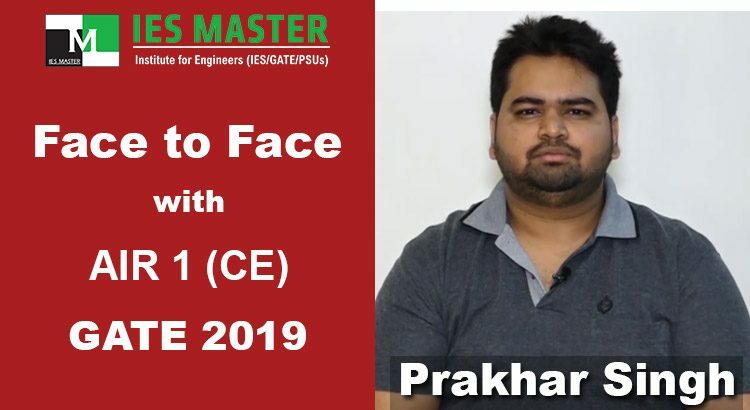 After graduating from IIT Bombay, how did you figure out IES Master for GATE and ESE preparation? Basically I was selected during campus placement by Shapoorji Pallonji. During my training period, couple of my friends asked me to try GATE and ESE. But I was not comfortable with the format that was there till 2016. So when in 2017, when the format changed, I thought that it is feasible and worth giving a try. As I was out of touch of with studies for around 8 months, I decided to join IES Master classroom program. So I left my job in February 2017 and joined the Classroom Program at IES Master in March 2017. Give us a feel of the learning atmosphere in the classroom at IES Master. Basically it started like a typical classroom session, but the more I went into it I realized that there is something special about the teachers at IES Master. For the first time, I felt like I am preparing for a national level exam here at IES Master. It was a totally different experience. It was here at IES Master that I learnt to apply the concepts studied in college. How was your experience with IES Master faculty? The faculties at IES Master were very much caring and understanding. They are aware of the problems faced by students. They are very helpful in finding out solutions rather than creating problems. How did you find this year’s GATE paper? What I have analyzed is that since 2016 the GATE paper has become too basic. If your basics are strong, you would find it very easy. If you solve the previous years’ GATE papers rigorously, you would notice that how the trend is becoming now. What types of formula are being asked? What types of concepts are being taken into consideration? Solving what type of numerical problems would be more beneficial? Which theoretical concepts should be memorized? If you would take all the test series religiously then definitely you would find the GATE paper easy. The same thing happened this year. Concepts from the questions asked in the past GATE papers have been used to set this year’s paper. While writing GATE 2019, I felt like I had already attempted the paper. The only difference was that it was asked in a different way. You just need to apply the formula to solve the paper. You will experience this feeling only if you had practiced a lot. What was your strategy with regard to attempting GATE paper? In GATE, time management is very important. In three hours, you have to attempt 65 questions. It appears to be easy, but the reality is totally different. Some questions are tricky, and you have to keep in mind the accuracy also. My strategy was that first I attempted only those questions that I was sure about solving in the first attempt itself. Time consuming questions were left for the last. During the test series, I followed the same strategy, and while writing the GATE also I did the same. In fact, I completed my GATE paper 15-20 minutes before time. This helped me in revising and checking if I had any mistake or not. How was IES Master Test Series helpful during your preparation? I took IES Master Online Test Series, in which there were almost 60 tests. As the difficulty level of Test Series is a bit on the higher side as compared to GATE, it helped me a lot in pushing myself to score more. I never scored more than 85 marks in any tests of the test series, but it was quite a learning experience for me. The test series, which includes single topic, mixed topics as well as full-length tests, helped me a lot in covering the entire GATE syllabus, and prepare myself in a better way. Give an insight into the two sections of GATE. Section 1 includes Engineering Aptitude and General Studies. So, you need not to take it lightly as it is very important part of GATE. Engineering Aptitude is like common sense that you had been studying since your school days like subjects like General Mathematics and General English. For English, you need to prepare a bit if you are not used to it. So you need to be prepared for it. For section 2, one should remember all the formulas, short tricks, etc. One should practice a lot, so that all this should be on your fingertips. This will help you in solving some questions with speed, and get extra time for questions that are tricky. So, one should be regular about revising these basic subjects thoroughly. How to build upon confidence in design subjects like Steel, RCC? For design subjects, I would suggest that one should remember the Code Specifications because nowadays questions are based on them only instead of direct formulas. Formulas are easy to memorize, but remembering the Code Specifications is very important. For instance, this year in GATE 2019 one question was there from section IS-456 of RCC. This section is such that no one wants to study it as it is very boring. But a student writing GATE has no excuse if any question comes from this section. So, I recommend all the GATE aspirants to study Code Specifications thoroughly. Try to understand what types of questions are being asked by GATE in the last two-three years. Ask your teachers also as they have been analyzing this trend. I was basically preparing for Engineering Services Examination, and I took ESE 2019 Prelims in January. For GATE preparation, I started with understanding what is more important for GATE. For that I referred the previous years’ questions, and solved them without revising. The other problematic thing that one might face while writing GATE is the virtual calculator. Most of us are used to the Casio calculator with auto functions, but the GATE calculator is very basic. GATE calculator is used with mouse only. So, one has to practice a lot to get accustomed with the virtual GATE calculator. What I did was that I did not touch the Casio calculator, and solved questions using the virtual GATE calculator only. Second thing was numerical questions. As ESE doesn’t have numerical questions, I made a different strategy for that as it requires too much accuracy. A change in single decimal can take you out of the range of the answer, costing you 1 or 2 marks along with negative marking also. So to develop my accuracy level, I solved as many as questions that were possible. After that I took Online Test Series, and prepared a schedule for taking the test series and studying on my own. I made the schedule in such a way that I am writing test on a subject in the morning, studying another in the afternoon, and then taking another subject’s test in the night. In the real GATE also, you would face such questions from different subjects arranged randomly. This will help you getting in the real exam mode. How many subjects you used to study in a day? I used to pick only three or four subjects, not more than that because doing more than that may have a negative impact, and also it’s not feasible to do so in an efficient manner. So prepare your schedule as per the time that you have in your hands, and then stick to that schedule. If you will not follow the schedule, your backlog would keep on increasing. What is your take on IES Master study material? I found IES Master study material to be very precise and to the point. And if it is civil engineering then the course is so detailed and vast that a student cannot cover it all. IES Master study material on different subjects is to the point and as per the syllabus. This helped me a lot in keeping myself on the track. It was very good. Give us a brief overview as to how the short notes of a GATE topper look like. Preparing short notes is very important because in the last week of your exam, you cannot refer all the registers. 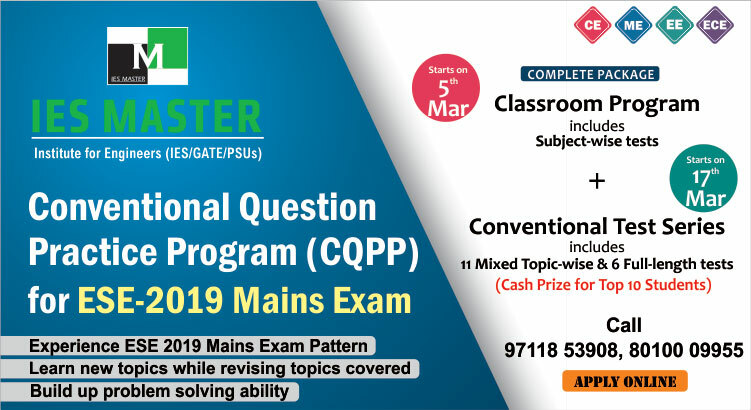 There are 17-18 subjects in civil engineering alone, and if you had prepared one register for each subject then it would be next to impossible to refer all those registers in the last couple of weeks. So you should have something in short to revise all these subjects in a short period of time. So when you are studying, make short notes of the things that you think needs repeated revision. I did the same, and included only those things in my short notes that require multiple revisions to memorize. Keep the short notes as short as possible i.e. be very precise while making notes. Go through them on regular basis. At the end, make your schedule in such a manner that by just flipping over the pages of your prepared short notes, your entire syllabus is covered. This will save time, preserve your energy, and keep a check on your confidence level. In my opinion, preparing short notes is very important. When you are writing the test, you have to keep in mind your accuracy level. Be humble while writing the test series. Don’t allow your ego to come in between. The main objective of test series is to help you improve. Don’t have the misconception that the test series is going to trick you. It’s a learning tool that will enable you to know the areas in which you are lagging behind. On the day of the exam, make your entry like a hero. Keep in mind that you had worked very hard honestly. Have a positive attitude, but don’t overdo it. Even if you come across some difficult questions during the real exam, don’t lose heart as if you are not able to do it despite taking so many test series then nobody can. You would not be the one finding that particular question difficult to solve, there might be many others. So don’t lose heart. Go with this attitude, and never panic. If you’ll panic, you would not be able to answer the questions that you could, and sometimes you might even leave some questions unanswered. So, have a positive attitude, stay calm, and you’ll do great. Having aced the GATE exam, what are your future plans? There are many options. There are PSUs, admission in M.Tech or Ph.D also. Other than this, there are some foreign universities also that accept GATE score. There are many options for me, but I am currently preparing for Engineering Services Examination (ESE), and I will continue with that, and then see what the future holds. Your message to the GATE aspirants from IIT Bombay? What I have seen and observed is that IIT Bombay students know all this better than me. When I was in college, I was not thinking about these things. I believe they know better than me. If I have anything to say then I would like to say that be honest with yourself, if you believe you can do it then keep on doing it honestly. To all the GATE aspirants, I would like to say that be honest, carry on with your preparation, have the attitude, and you would be able to clear it. How would you remember IES Master? There is a tough competition out there. During the classroom programs also, there was competition among students for solving the problems correctly and accurately first. Overall it’s a very healthy environment. There should be competition, because without competition you would not excel in life. If there won’t be competition then you won’t be able to work hard. Rest it’s all up to you, how hard you study. You have been an excellent student here at our institute. You are one amongst the many gems that IES Master has produced. We are so proud of you. God bless you.